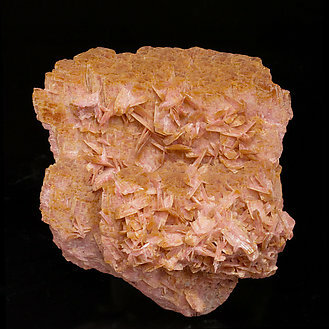 Aggregate on matrix of extremely sharp and flattened prismatic crystals. They have a clear salmon-pink color. 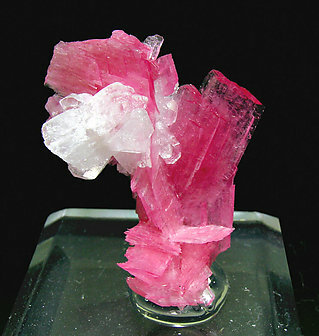 One of the nice surprises offered by the mineralogy of Inner Mongolia in the past year 2011. Very well-defined flat crystal with sharp outline and faces, transparent, bright and of an extraordinary color. The quality is rare for the species. 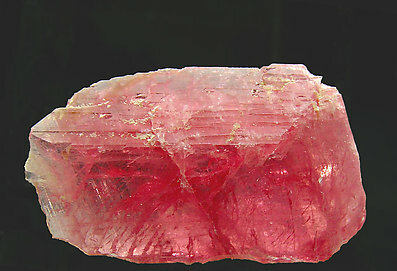 A very well-defined flat crystal, on matrix, with sharp outline and faces, transparent, bright and of an extraordinary color. The quality is rare for the species. On the upper right termination there is a small, neat curved notch that on first impression looks like a fracture but, after a detailed observation, we think it is a growth defect. 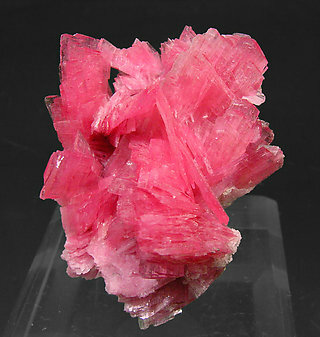 Group of flattened crystals of sharp, very well defined faces and edges and of very intense and uniform color and an excellent luster. 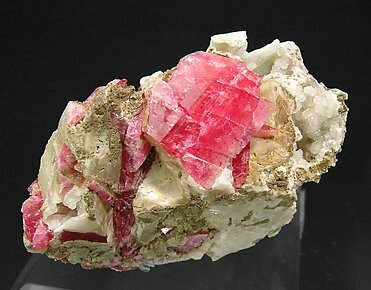 Divergent growths of flattened Rhodonite crystals that are bright, translucent but with some transparent terminations and with a very intense pink color. 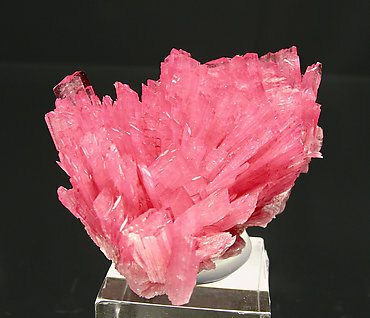 The crystals, more isolated than usual, are on Calcite matrix. 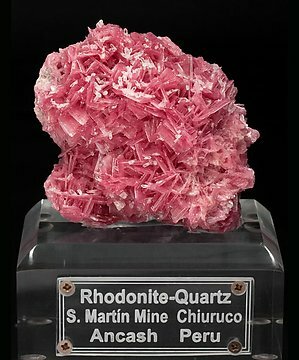 Flattened Rhodonite crystals, with a laminar habit, translucent and with excellent and very intense color. Small white Calcite crystals add a nice contrast. Group of flat prismatic crystals, very well-defined and bright and more isolated than usual for that mine. They form fans. We specially note its color, extraordinary even for the most usual from the locality. 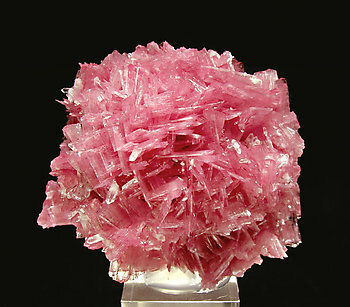 On adition there is a tabular Pyrrhotite crystal with sharp faces and edges. On the back of the sample there are small crystallizations of Sphalerite and Pyrite. Considering all the items it is a high level specimen. 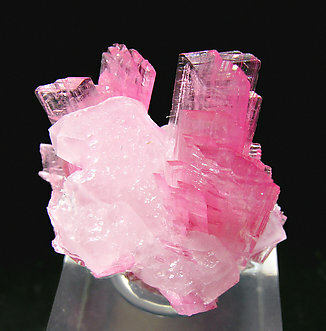 Groups of sharp, flattened, prismatic crystals, some of them doubly terminated, of exceptional transparency and color, on a matrix of white crystals of Calcite, crystals of Quartz and small crystals of Pyrite. Just look at the color! 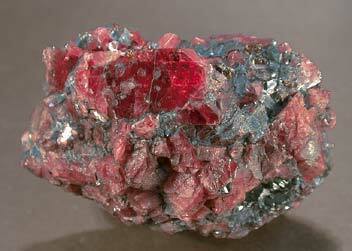 It looks like someone has lit a fire inside this infrequent mineral. 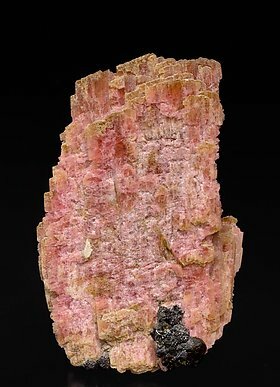 It is also of interest as it comes from a very famous mine: Broken Hill, which is the best locality known for this mineral species. 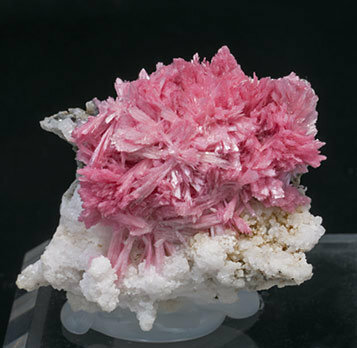 Floater fanlike growth of very large crystals of Rhodonite, one of them clearly dominant, with groups of Magnetite crystals and small brown crystals of manganoan Tremolite. 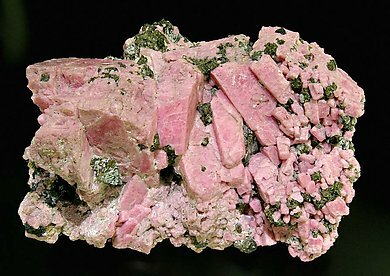 The sample has been adequately analyzed and we’ll send a copy to the buyer of both analysis, the Rhodonite and the manganoan Tremolite. 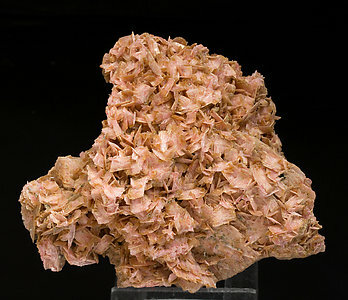 Group of laminar crystals of Rhodonite showing parallel growths and rosettes, with very intense pink color and brownish concretionary growths of manganoan Tremolite. Both species have been analyzed and we’ll send a copy of the analysis to the buyer. 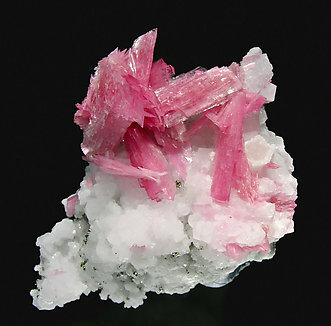 Group of flattened Rhodonite crystals of excellent color and luster with growths of smallwhite crystals of Quartz. 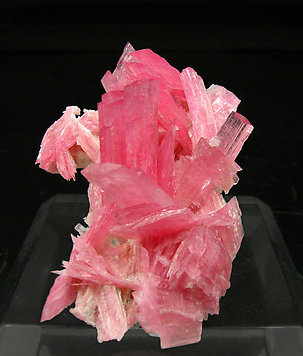 We especially note the intensity of the color, nearer to red most than pink, which is characteristic of the July-August 2007 samples. 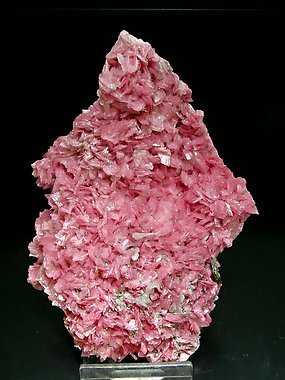 Group of flattened Rhodonite crystals of excellent color and luster with small crystals of Quartz and Pyrite. 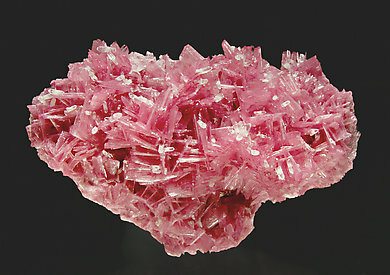 We especially note the intensity of the color, nearer to red more than pink, which is characteristic of the July-August 2007 samples. 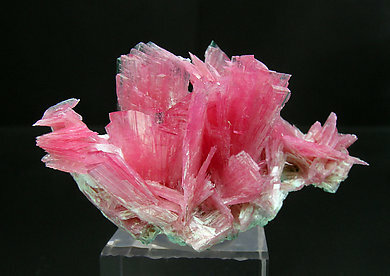 Very aerial and esthetic group of sharp, flat prismatic and very well defined crystals. 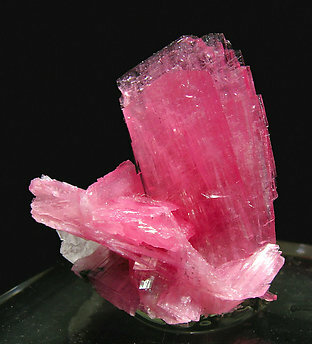 They have an excellent luster and an extraordinary color, surely the best among the Rhodonite samples from the locality.